Louisiana Tech University hosted the American Society of Civil Engineers (ASCE) and American Institute of Steel Construction (AISC) Deep South Conference last week. Thirteen universities from across Louisiana, Arkansas, Mississippi and Tennessee converged on Tech’s campus to showcase skills in designing and building buoyant concrete canoes, bridges that can hold large loads of weight and structures that can sustain severe weather events. Louisiana Tech Concrete Canoe team members and former members are (pictured from left) Noah Perkins, current ASCE member; Seth Garner, lead canoe captain; Josh Ridley, racing captain; Reed Edwards, construction/racing team; Miller Boyd, ASCE officer; Arthur Baldwin, lead canoe captain; Gabe Clottey, construction team; Allie Thurman, ASCE/AISC President; Katya Opel, ASCE/AISC VP and canoe aesthetics captain; Tracey Stephens, alumni; Lannie Skelly, racing team; and Sydney Bratton, ASCE officer. 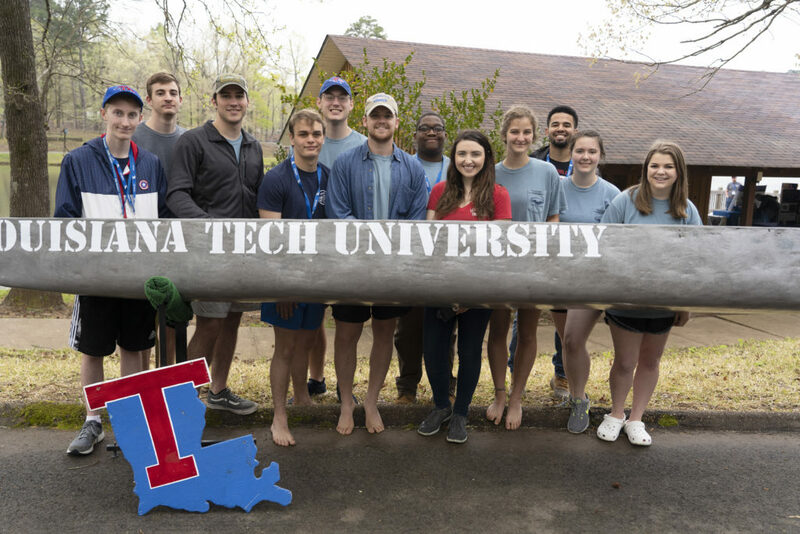 The Louisiana Tech teams earned first in several categories, including the Concrete Canoe competition, the Mead Paper competition and the Oral Presentation competition. In addition to winning the Concrete Canoe competition overall, the team won first place in three of the five races. The team also won second place in the Design Report competition and third in Surveying. The Steel Bridge team won third place overall. The Sustainability Doghouse team won first in the Oral Presentation and Design Report categories. Tech student chapter president Allie Thurman says that the results of the competition reflect the hard work that the teams and officers put in to organizing and preparing for the various competitions. To organize the event, the Tech student chapter of ASCE/AISC raised more than $45,000 in support funds, developed schedules, compiled email lists, recruited judges, organized technical reports, communicated information, ordered food and reserved venues. “Louisiana Tech is the first school to compete in ALL of the competitions AND host the conference in my four years in the ASCE organization,” Thurman added. “Even though we are finished with the regional conference, we are currently preparing for the ASCE Concrete Canoe national competition that will be hosted in Melbourne, Florida this June!